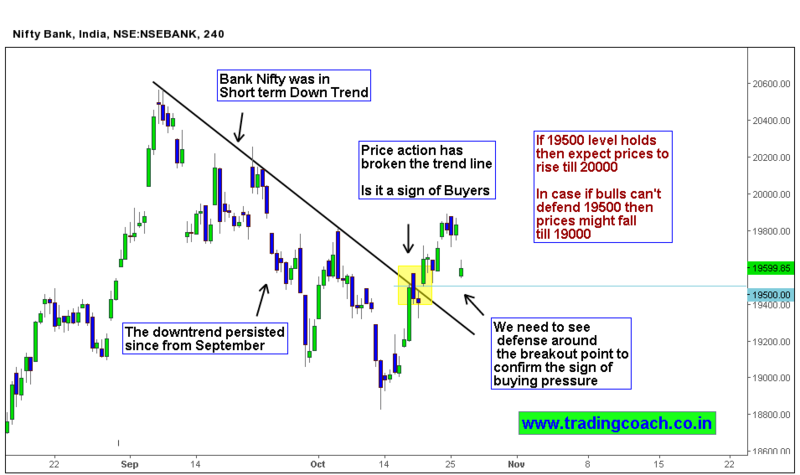 Price action broke the trend line at trading intersection of 19500. It is necessary to decide whether the breakout is valid or not. As we move towards the Diwali occasion, sometimes seasonality factors may play a major role and influence the price action. Seasonal movements are naturally short living, so it makes sense to not give into the breakout at face value. To make sure that buying pressure is strong enough, we need to see retest around the breakout point 19500. Prices may test the breakout zone multiple times. We need to look for some strong defense by bulls to confirm their dominance..
Price action Trading thesis is in the 4 hr chart of Bank Nifty Listed above..
Bank Nifty | Price action is trading near last year’s high what’s next?